Cookies for breakfast? Why not? If it’s healthy I’d say yes please! Breakfast oatmeal cookies sounds appealing to me because it’s another way to have oatmeal in the morning. It can be stored in the fridge and great for snack later. Trust me, its tastes good too even when its cold. When I store these in the fridge, they disappear fast! 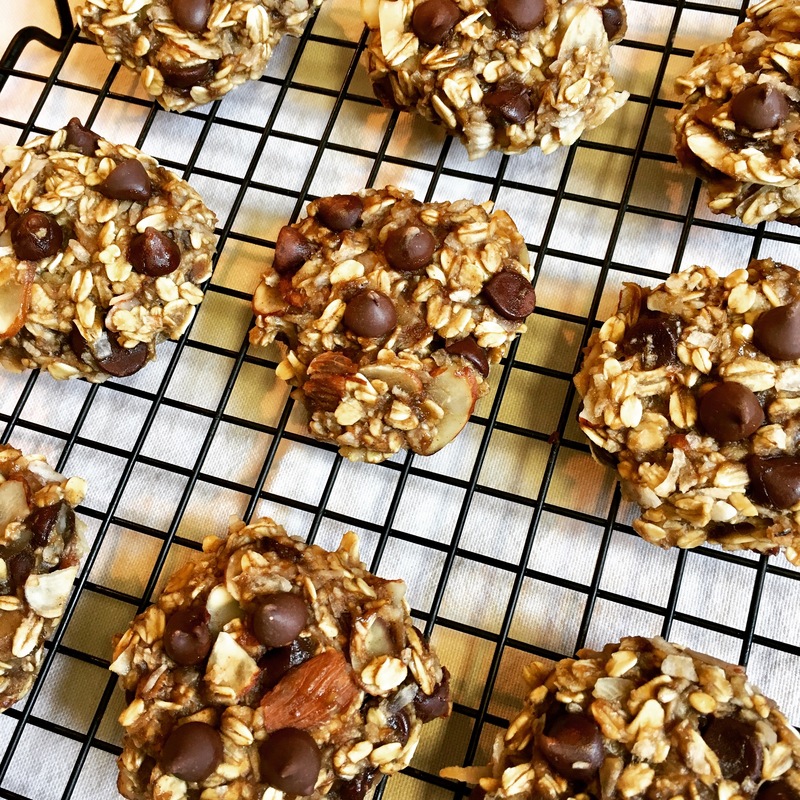 For this recipe I combined just healthy ingredients like very ripe bananas for natural sweetness, old-fashion oats, unsweetened flake coconut, dark chocolate chips, cinnamon and almonds. Only six ingredients! There is no flour, added sugar, eggs or butter here. The very ripe bananas provide the sweetness and make all the other ingredients come together. Simply adding sweet cinnamon for flavor makes it delicious. Making these breakfast cookies happens very quickly. First, preheat the oven to 350F degrees. Next, mash very ripe bananas and add the oats. Mix these together and then add the cinnamon, flake coconut, dark chocolate chips and almonds. Stir it until the ingredients just come together (the batter will be wet). Lay parchment paper on two large baking sheets. The second baking sheet can be a smaller size. I use a small cookie scoop to measure about 1 1/2 tablespoon of batter and drop it on the baking sheet. Because there is no flour, eggs or baking powder this cookie will not rise quite like regular cookies. It will not spread either because there is no butter. After dropping the cookie batter on the baking sheet two inches apart, use a spatula to gently flatten it and push in the sides to make it more round. This will help shape the cookies. Bake the cookies in the oven for 12-13 minutes one sheet at a time. My gas oven takes 13 minutes to bake these cookies. This recipe makes about 12 cookies. You can double the recipe if you like. When the cookies are done, let them cool on a rack. You can store the cookies later in a covered container in the refrigerator. If you are looking for a healthy alternative to cookies, try these breakfast oatmeal cookies. They are so easy and quick to make and the ingredients are so good for you. Happy baking! These healthy cookies have only 6 ingredients and are good for you. Easy and quick to make too. Mash the bananas in a bowl. Add the oats and mix it well. Stir in the flake coconut, dark chocolate, cinnamon and almonds. Use a small cookie scoop to measure about 1 1/2 tablespoon of the batter and place them on the baking sheets two inches apart. Gently flatten the cookies with a spatula and push in the sides to make it round. You can add a few more chocolate chips on top if you like. Bake the cookies in the oven for 12-13 minutes. When cookies are done, let it cool on a rack. Store cooled cookies in the refrigerator in a covered container.